Thank you to the generous donors that responded to our request for support to purchase a new van for our teen shelter, Youth Emergency Service (YES). Donors included: Barbara Rittenhouse, Dorothy Stevens, Laurie Ward, Barbara O’Brien, Pat Rentschler, Dina Ghen, John and Theresa Barth, Betsy Wice and Lucy Andrew Cummin. We are grateful for their kindness. Vans at YES get maximum use with activities such as outreach in all Philadelphia neighborhoods to transportation for group activities. “Now we’re talking!” exclaimed one of the youth when first setting eyes on the new van purchased for our YES teen shelter. “You’re going to let me drive it right?” said another youth with a wide grin after the Director, Tim Massaquoi, ended a small speech of gratitude to donors for this very important part of YES programming. Having reliable transportation for the teens e nables the shelter to provide services that might not otherwise be available. It affords access to additional programming outside of the immediate area, as well as dependable transport in case of emergencies. But that’s not all. Over the course of the past year YSI was able to engage with teens all over the city distributing over 1,600 care packages containing safety tips, snacks, bottled water, toothbrushes and feminine hygiene products. 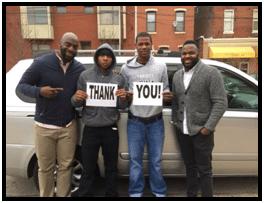 The shelter appreciates your continued support and for your interest in the work that they continue to do for the youth of Philadelphia.